Published on April 18, 2009 in Bands/Artists, Eastern Iowa, In The Bins, Interview, Media, Music, Out and About, Retail and Site News. 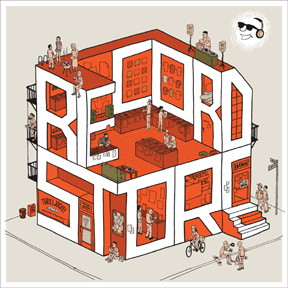 0 Comments Tags: 2009, Live, record store, Record Store Day, Vinyl. 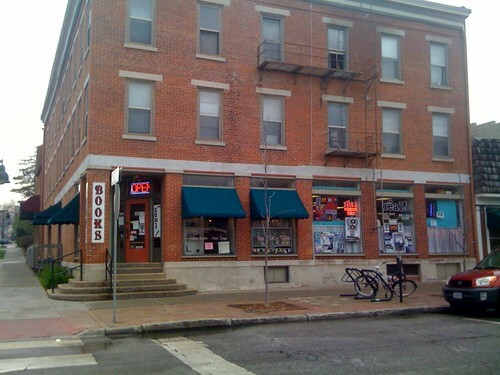 Since Cedar Rapids, IA no longer has an Independent Record Retailer, there are no stores here participating in Record Store Day 2009. Record Store Day has been going on for a couple of years and I haven’t participated in it. This year, it seems like all of the record labels have made special releases, including one from Thrill Jockey– which is a first for them! 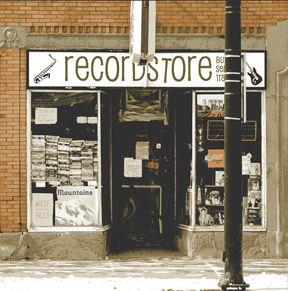 Along with my friend Erik and Alex, we are going to do a “Record Store Crawl” by hitting three record stores in two cities in Iowa– two stores in Dubuque and one store in Iowa City. The total trip will be 169 miles accounting for 3 hours of driving! I will be doing a live twitter of the events, which will also include pictures. I’ll be doing updates here, too as I can. 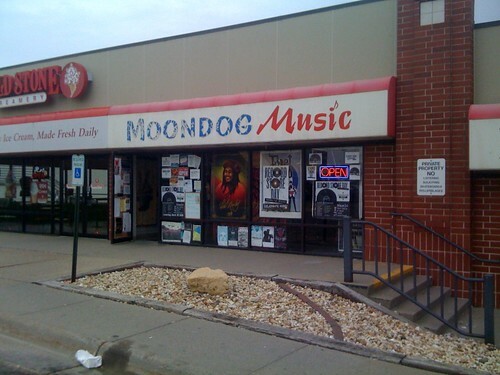 Published on February 21, 2009 in Bands/Artists, Eastern Iowa, Music, Out and About and Reviews. 0 Comments Tags: 2009, Cedar Rapids, csps, Gary Louris, IA, Jayhawks, Live, Mark Olson, Ready for the Flood. Like a lot of people I became a fan of the Jayhawks around the time of the airplay of what was arguably their biggest hit “Waiting for the Sun” off of Hollywood Town Hall in 1992. That album plus the album Short Man’s Room by Joe Henry recorded with the Jayhawks in tow really propelled the obscure Twin Cities band to the fore of my daily soundtrack. Fast-forward to 1995 and I’m living in Minneapolis– home of Prince, Bob Mould, Soul Asylum, and the Jayhawks. 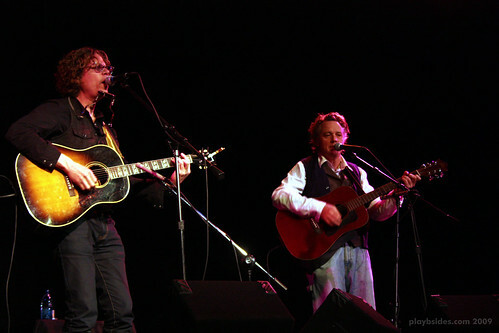 1995 brought a new album from the Jayhawks– Tomorrow the Green Grass— and what would be the last album to feature the songwriting partnership of Olson and Louris the principle songwriters and shared frontmen for the group. 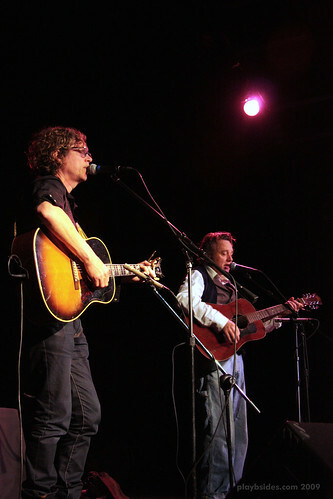 Although the album failed to meet the expectations of success set by Hollywood Town Hall— Tomorrow the Green Grass was the craftwork of extensive touring and the years of Olson and Louris working together. In Minneapolis the album was local-boys-done-good– played on Cities 97 and Rev105 (R.I.P.) all the time and it was as much a soundtrack to my Minneapolis years as Hollywood Town Hall was to my post-college years. 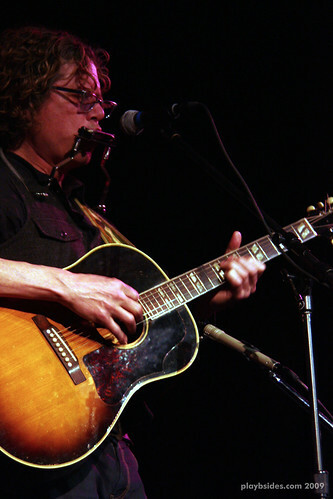 It was the love note of “Miss Williams’ Guitar” on Green Grass that foretold the future departure of Olson from the Jayhawks leaving Louris carrying the mantle of the band through three more albums. By the time the following 1997 album The Sound of Lies came out, I was back in Iowa with my future wife and daughter and concerning myself less with the rootsy sound of Americana bands like the Jayhawks, Wilco, and Son Volt and more with electronica, triphop and the post rock sounds coming out of Chicago. 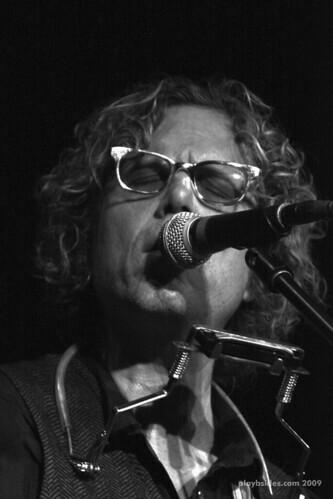 It wasn’t until 2007 when Mark Olson released his first solo album The Salvation Blues and I had a chance to interview him that I started digging back through the Jayhawks catalog. 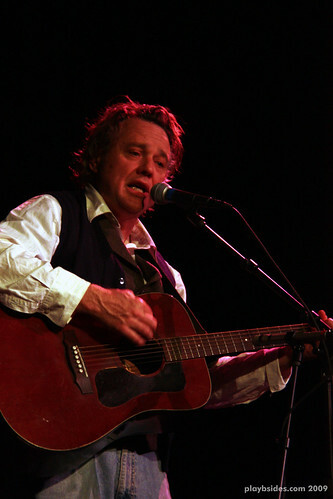 Mark’s show in February 2008 at CSPS was enlightening and the sound of a man turning a page in his life as a musician. By the time I saw him last year, the plans were already underway for Flood— both men having put whatever differences they may have had in the spirit of working together again. The sessions for Ready for the Flood were produced by Black Crowes frontman Chris Robinson which were really a culmination of two “reunion” tours and a desire to work on new material. 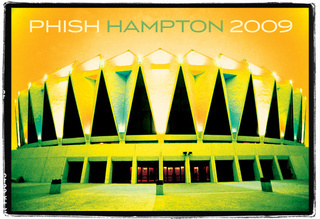 Robinson provided a very subtle organic sound to the recording leaving most of the sonic shape of the album to be made by the vocals and acoustic guitars. 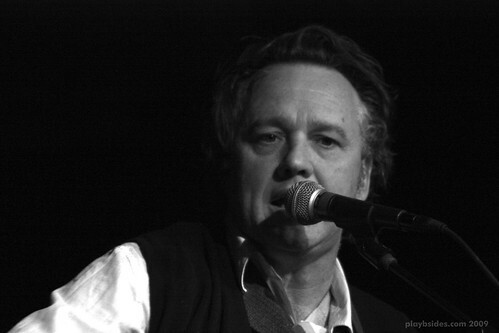 The album was shelved in favor of letting Mark tour in support of his new album, which also provided Gary the opportunity to continue working with Robinson on his first solo album Vagabonds. Vagabonds was one of my favorite albums from 2008 and was released in a wonderful 180g vinyl pressing with gatefold cover. Gary was also generous with bonus material providing an interesting guitar-and-vocals version of a handful of songs in the form of the Acoustic Vagabonds EP, as well as iTunes and Amazon exclusive B-Sides. A label switch in the fall of last year from Mark’s label Hacktone over to New West delayed the record release to late January but gained it a couple of bonus tracks. When the CSPS show was announced as part of a February mini-run for the East and Midwest, I felt we were pretty lucky to have this stop considering the size of the other cities on the tour– in fact Cedar Rapids sticks out as an irregularity in a tour that includes stops in New York City, Boston, Atlanta, Chicago and Minneapolis! But, part of the appeal of Cedar Rapids is its close proximity to I-35 and I-80 making it sort of a tour nexus. I waited until almost the last possible minute to work out my tickets– the show sold out soon after I got my ticket! I know on occasion that CSPS has sold out a show, but I’ve never been to one, and John Herbert made a comment about this in his introduction of the band saying that typical attendence for shows like Tuvan throat singers are around 40! The pre-sale of 175 was sold out and there was a waiting list of another 20-25 who showed up at the show that night hoping to get in. I was a bit shocked when I got to the venue– at 7:15 most of the prime parking spots on 3rd Avenue were already taken and people were already in seats by that time. Gary and Mark were put up on the big stage as opposed to the typical risers on the floor and the candlelit tables on the floor were replaced with rows of folding chairs. John Herbert was carrying out extra folding chairs to provide an ad-hoc front row for the last-minute hopefuls. I’m pretty sure they got them all in, which was cool. The crowd was a mix of ages, which Mark commented on during the show. Quite a bit of the crowd were 40-somethings like myself, but there were quite a few kids and a noticeable number of seniors which, I guess is a testament to the wide appeal of well-crafted songs. The show started roughly around 8:15 after a nice introduction from John Herbert where he told the crowd that while normally there would be a set break, there wouldn’t be one for this and suggested that if people needed to get up for a break they should, but hurry back to their seat. Mark and Gary ran quickly through the first three songs from Flood. They appeared to be very comfortable with the material and it looked to me like they had assumed familiar roles with each other. I hadn’t had the opportunity to see the Jayhawks in their heyday so I can only assume it seemed like this show. The two were joking around with each other dishing out good natured jibes. Olson seemed to ham it up a bit on stage while Louris played a bit of a straightman. Mark seemed to have developed thin blood since moving to Joshua Tree and was sporting not one, but two vests to combat the cold Iowa night and Gary commented that it was all about oneupmanship and he was planning to wear three vests the next night! The show was recorded by Tim “Cyfan” who recorded Mark’s show last year as well as some other notable shows I’ve been to in the last five or so years (Cracker Acoustic Duo at the Mill, Richard Buckner at the Picador) and he does a top-notch job. It will be interesting to hear how this translates to audio. Frankly, the acoustic setting of this show really presented an accurate picture of the Flood album, in my opinion, and even the most uptempo track on the album “Chamerlain, SD” with its “Kansas City” rhythm translated well to this twin acoustic attack. A few of the songs enjoyed an extended workout. A notable one was the ominous “When the Wind Comes Up” which got a really nice guitar solo in the middle. That’s a song on the album I wish had been longer, so it was great to hear what they can do with the song in a live setting. Of course the crowd really responded to the familiar Jayhawks catalog and certainly songs like “Waiting for the Sun,” “Two Angels,” and “Blue” paid appropriate tribute to their shared past. In a surprising and generous gesture Mark announced that they would be donating the proceeds from their CD’s that night to help CSPS in its recovery from last year’s flood damage. Additionally, they would hang around afterwords and sign every copy! These sales donated $750 to the Iowa Artist Relief Fund. A very touching gesture, indeed! It is notable how the new Flood songs fit so well with the established Jayhawks catalog and even after having the new album on my iPhone for a while quite a few of the songs were instantly familiar to me thanks to the well-crafted hooks they use. Songs like “Bicycle” with it’s repeated “hallelujah” followed by dirty guitar run and slide guitar and “Saturday Morning on Sunday Street” that wouldn’t sound out of place on a Simon and Garfunkel album are just as strong as “Blue” and “Two Angels” in my opinion. We are lucky to have these guys back together again. After the show was over, a line quickly grew at the merch table as people queued up to have their CD’s signed. A congregation formed in the lobby area participating in the bubbly afterglow of a genuinely great show. I hesitated leaving for a minute fearing the Iowa winter would dash it away. Click Here for the flickr photoset of the pictures I took at the show. Published on December 31, 2008 in In The Bins, Media, Music, Personal History, Site News and Vinyl. 1 Comment Tags: 2008, 2009, google analytics, happy new year, playbsides.com, wrap up. Last year at this time, I provided a year-end wrap up which included a breakdown of the statistics for playbsides.com. I’m fairly certain that I’m the only one who really is interested in this information, but still I want to capture it for posterity, if nothing else. February 21st will be the third year for playbsides.com which is a feat in of itself I think. Most of the “big” music blogs have been around for this long or longer, so that is pretty cool. I’m not sure how many people are regular readers– I have a handful that follow my site via RSS feed, but most folks come here via search engine by a large margin. Considering how many articles I’ve amassed here, it stands to reason that this will continue to be the norm. 2008 was a pretty big year for the website it seems. In 2007 we had 9,469 unique hits. We seemed to gain some very dramatic growth as we had 18,964 visits, with 16,651 of them being absolute unique visits accounting for 27,663 pageviews. The average visitor looked at 1.46 pages while they stopped by. I’d say this is supported by the fact that most of my traffic (66.42%) comes from search engines, so the average visitor would only be interested in the one article that was pertinent to the search result. Speaking of search engines, google.com is still the top driver of traffic at 11,611 visits accounting for 61% of my overall traffic. My top keywords are “fender baritone” which is up from last year’s #2 position. Apparently people are very interested in that rather obscure guitar. At #2 is “Lindsey Buckingham Gift of Screws” amusingly enough. I have a handful of articles I’ve written over the last couple of years while Lindsey prepared that album and the prior Under the Skin which had a shared history in an unreleased album. Down to the #3 position from last year’s #1 is “play b.” Interestingly (and I say that understanding that you’ve bothered to read this far) the next five keywords were all variations on searching for the Fender Baritone guitars. The homepage got 4,629 pageviews with 3,932 unique views. These stats are very similar to last year. 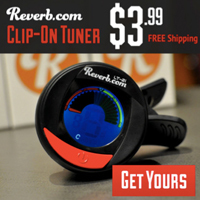 The second highest read article is not surprisingly the article on the Fender Baritone Jaguar at 2,429 unique pageviews– up from last year’s 1,754. The funny thing about this is that I seriously considered not selling this guitar last year just because of how popular this article is. At number three is the article about the discontinued Fender Stratocaster Hard Tail at 2,156 unique page views. At number four is the article I kept up-to-date providing the links to the freely-downloadable tracks for the new Pretenders album Break Up The Concrete at 1,414 unique page views. The popularity of this page is a testament of the power of mp3 crawlers like elbo.ws. These mp3’s were “unveiled” once a week until the release of the album. The reason this article was popular was that no one else was keeping track of the prior-week’s downloads. A comment I would make is that most of the “internet PR” people don’t really understand how the Internet is used related to finding information and a lot of the neat opportunities for promotion are missed based on short-sighted planning like this. In the third year of this blog I think I learned a lot about what kind of content is the stuff that people are interested in reading, and certainly what content is read most. As I look back on the year there were a lot of really interesting developments in the music industry and in some respects 2008 was sort of a turning point for the industry where it was taught some lessons– if not learned them. With news of the RIAA changing its tactics in prosecuting copyright violators one would hope that the approach to the music consumers would be one where the music industry would be more about getting the music to the fans in a format that they want than it is about holding on to old practices and ideas surrounding ownership. 2009 brings a US President that is a first in many important respects, but is also a President I think that represents the population more accurately when it comes to technology use– he was an avid Blackberry user, apparently he has a Zune (for whatever that means). His campaign was grassroots, but arguably won via a successful Internet campaign that he seemed to be very involved in orchestrating. Whether or not you agree with his positions on the political topics, he certainly is more like the people reading blogs like mine than the competing candidate was in my opinion. What this means for the country is anyone’s guess at this point, but I’m hopeful that we see more reasonable legislation when it comes to matters of intellectual property, copyrights and patents and social parity when it comes to availbility of technology and information. As always, thanks for stopping by and support your independent record retailer. The Time to play b-sides archives for the 2009 tag.